Samsung's Galaxy S7 and Galaxy S7 edge are already two of this year's most popular new smartphones, and they're only getting better with age, as the arrival of new software updates continue to stamp-out bugs, improve system stability, and deploy new features. We just told you about the latest updates rolling out for GS7 and GS7 edge users on T-Mobile, delivering things like FM radio support. Now it's Verizon's turn for some Galaxy S7 update action, as the carrier gets starts delivering some updates of its own. Verizon just published the changelogs for the software updates on both phones, including things like an improved Always on Display clock roaming display when you're traveling to new time zones, an improved interface for analyzing app performance and memory consumption (helping you spot any problem software), and bugfixes galore. The Galaxy S7 edge gets some unique enhancements of its own, including quick-glance events for the Calendar Edge panel and an expanded “new features” section to help explain some of the phone's capabilities to curious users. These updates are also doing what they can do make sure that all Samsung's work in bringing back waterproofing to the Galaxy S family isn't going wasted. 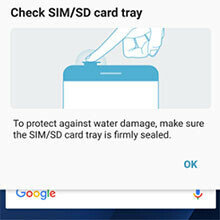 The new software for both the Galaxy S7 and Galaxy S7 edge delivers messages to remind users to keep their SIM/microSD tray tightly sealed, helping to keep any moisture outside, and not sneak through a crack in the phone's waterproofing armor. By all means, pop that tray open and equip your flagship with a nice, big microSD card befitting its majesty – just make sure you snugly secure it afterward. No FM radio for Verizon? The wife will be disappointed. Not true. I had it on my Samsung Omnia, and I believe also the Omnia II. But that was long before the increase in overall data streaming in America. So do phones have correct fm radio hardware but no apps for it or something? Always wandered what's that about. All phones have FM receivers. They are integrated in the bluetooth chip, wifi chip or SoC. Here's the but: only a minority of the phones have the FM antenna pin connected to the wired headset. E.g. all Exynos variants of the S7E (which are not sold in Europe, so american carries don't have anything to do with it, it's Samsung's own greedy decision to do it) have the pin grounded. This is obvious at hardware level, so it will never ever work. A little bonus update For those Verizon Galaxy S7 users who are unaware http://www.smartphonesupdates.com/latest-verizon-update-galaxy-s7-galaxy-s7-edge/ not mentioned in the change log. please share your thoughts about this service. I have the app key auto-clicking issue. The issue persists after the latest update and even after factory reseting 5 times. I didn't see this issue being addressed in this update, so maybe mine is defective? Probably defective yeah return it on warranty.